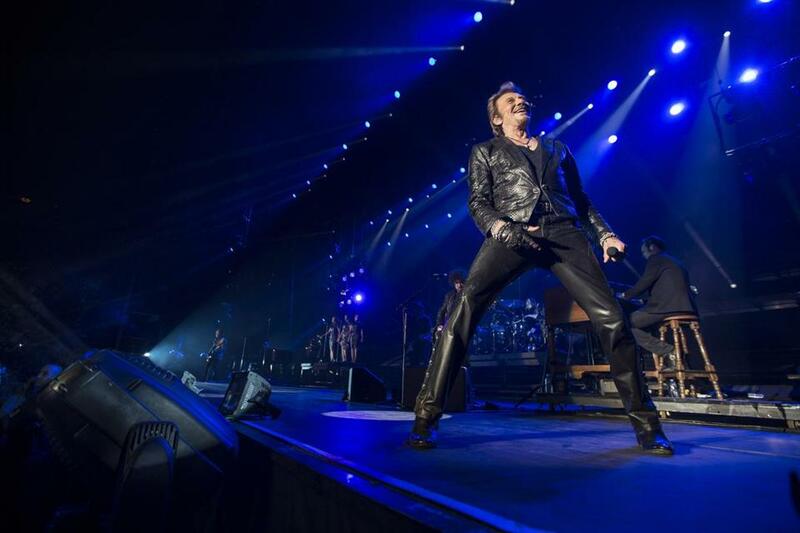 You may be mildly curious as to why you should be excited that Johnny Hallyday — a leathery, orange-skinned 70-year-old singer with liquid blue eyes — is performing in Boston tomorrow night. Or simply wondering who on earth he is. Keep reading, because unless you’ve spent time in France, Johnny Hallyday is the biggest living legend you’ve never heard of. This may sound like hyperbole wrapped in a crepe and served with a caramelized sugar and butter sauce. But Hallyday, a European rock pioneer, has sold more than 100 million records, made 47 studio albums and 26 live ones. He has been on more than 2,100 magazine covers. When he went into a medically induced coma in 2009, France practically screeched to a standstill as the nation held its breath to see if their national icon would survive. He’s also a movie star (his latest film came out earlier this year) and despite the occasional health hiccups, has absolutely no plans to retire. The nickname that Hallyday picked up in the early days of his career was the French Elvis. It’s not one he’s particularly fond of, but it’s easy to see why it stuck. When he first emerged in France in the early 1960s, his blond hair was coiffed upward into a rockabilly pompadour and his windbreakers were cooler than James Dean’s (Le Coq Sportif, perhaps?). “It’s been following me all my life,” Hallyday says. “It’s true, I was a big fan of Elvis, and when I started, I used to sing a lot of Elvis songs. So maybe that’s why people call me the French Elvis. But I became more Johnny Hallyday than a copy of Elvis. Despite an appearance on “The Ed Sullivan Show,” Hallyday was never able to take his star trans-Atlantic. It’s easy to see why Hallyday was a sensation in his homeland. In his late teens he looked like a dreamy matinee idol (he began as an actor) and sounded like a bad boy with a guitar. He learned about rock thanks to his childhood guardian, an American named Lee Hallyday. The elder Hallyday listened to Elvis, along with artists such as Gene Vincent and Eddie Cochran. What followed were more than 100 tours, high-profile marriages, and a music career that grew from French covers of American pop hits to collaborations with Jimi Hendrix, who opened for Hallyday in 1966, and songs recorded with Jimmy Page and Peter Frampton. Hallyday has an endless supply of these stories. His adventures nearly ended in 2009 when first he battled colon cancer, and later that year a spinal operation went wrong and became infected. He was put in a coma for a second operation, and nearly lost his voice. He is careful to point out that this was the fault of a surgeon, and not his own health, which he says is fine. He even demonstrated just how limber he is last year while performing at the Beacon Theatre in New York. Mid-concert, he dropped to the stage and began gyrations that sent the mostly French and mostly 50-plus audience into a frenzy. He gave his leather trousers a workout. Hallyday has long been a resident of Los Angeles, partially for tax purposes and partially to live paparazzi-free. Despite spending all that time in the United States, he’s never staged a large tour of the country. This is the first time that he’s playing cities such as Boston, Houston, Dallas, and Miami. He’s in the early stages of putting together a duets album, and he’s hoping to work with acts such as Paul McCartney, Stevie Wonder, and Jon Bon Jovi. If he pulls it off, it could be his first US success.